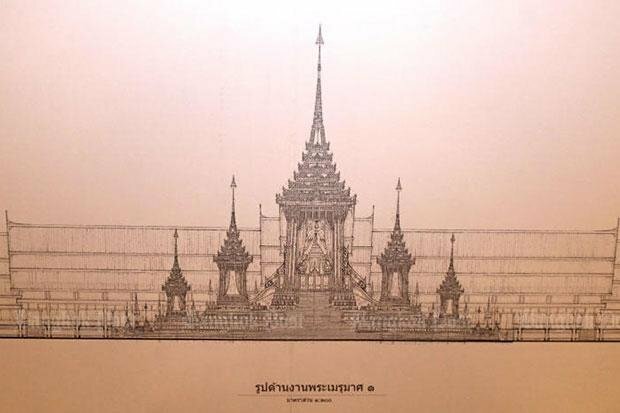 The Fine Arts Department of the Government of Thailand has revealed its traditional design for the funeral pyre for King Bhumibol Adulyadej, who died last month, with construction scheduled to start in January and to be completed in September next year. The pyre is expected to be placed in from the Grand Palace in the centre of Bangkok, on Sanam Luang square. Anandha Chuchoti, the director general of the department, told reporters that the structure would be more than 50m high, and would have ponds at its four corners. The ponds will display models of the Chai Pattana Foundation wind turbines, he added. Creatures from Buddhist and Hindu texts such as Garudas, angels, and creatures from the Himmapan Forest will decorate the pyre. The government has formed a committee for the royal pyre-building, made up of artists as well as officials. Some 8,000 people are expected to be part of the cremation ceremony when it is held in 2018. The date chosen depends on how long visitors continue to arrive at the palace to pay their respects to the former monarch. The king’s coffin will be made of teak wood carved with rose decorations and mixed with pure gold. No cost has been given for the obsequies. 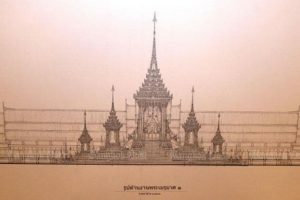 According to the Bangkok Post, the design of the royal pyre illustrates the imagery of Mount Sumeru, he said after a meeting of the royal pyre building committee at Government House. The sacred mountain is where the King’s spirit will return after his body is burned, according to Buddhist belief.